You’re never too – let’s agree on ‘mature’ – to learn new stuff. Before meeting Auto-Trail’s new Imala 734, I thought Luton meant a terminally under-achieving English soccer club. 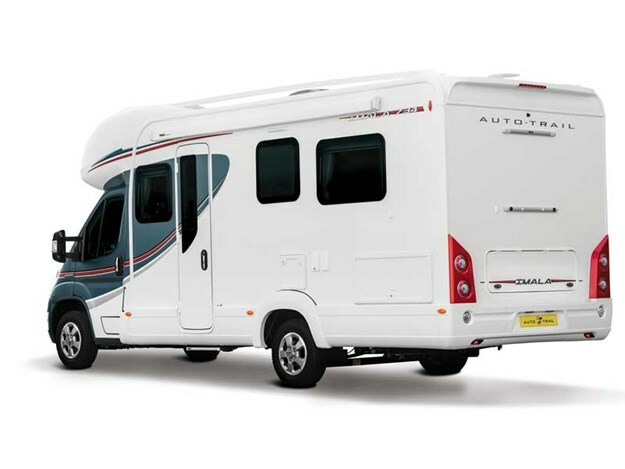 More informed readers will know it’s a motorhome with an area above the cab, usually for a double bed, something that has drifted out of favour in recent years but makes a welcome return in the 734 Hi-Line version. However, the 734’s major excitement – in both Hi- and Lo-Line models – happens in the downstairs bedroom, where two fixed single beds replace the island double of the Imala’s earlier iteration, the 730. Bill Savidan reviewed that model in our February 2018 issue. 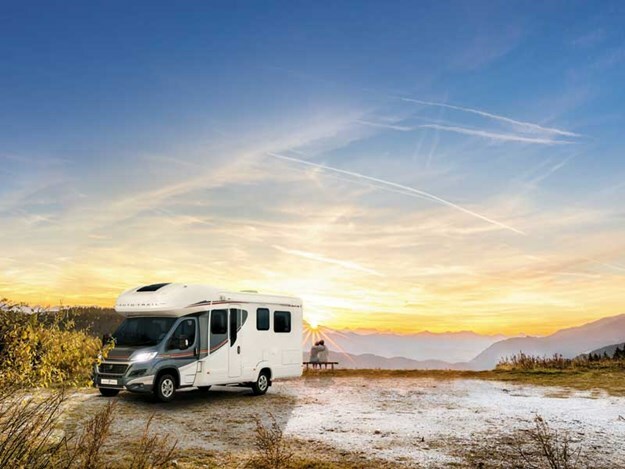 For Auckland Motorhomes’ sales consultant Gary van der Westhuizen, the 734 is "the perfect motorhome when it comes to versatility. 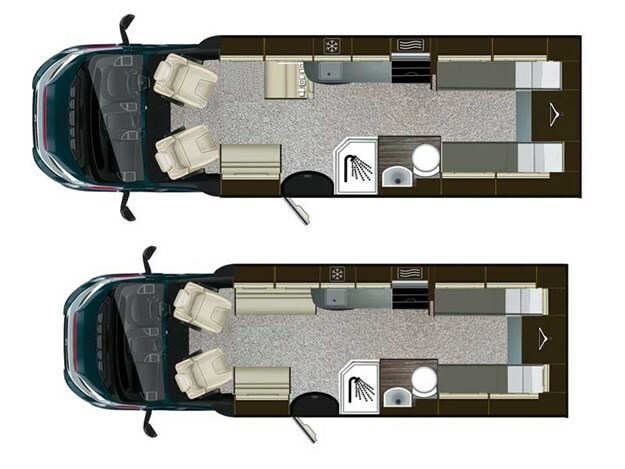 The Lo-Line is the ideal couple’s getaway leisure vehicle, as twin-bed motorhomes will help you to get a better night’s sleep ready for the next day’s adventure, while the Hi-Line offers a vehicle for the whole family." 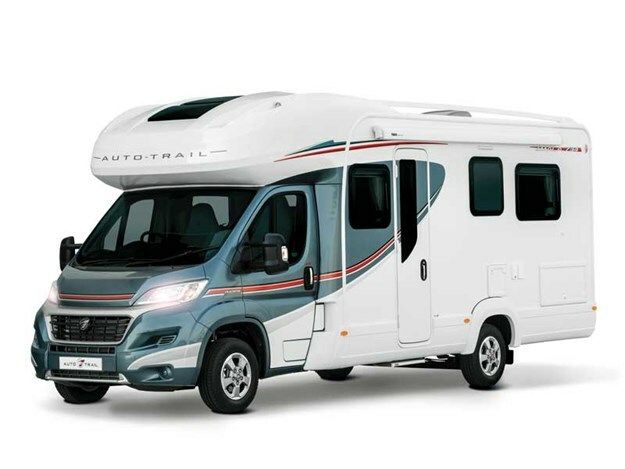 The Imala range is Auto-Trail’s entry-level motorhome, though the British manufacturer’s elevated standards of good looks, build quality, style, fixings and fittings, supported with long-term warranties from Dan Monk’s Drury-based AMH operation, mean that’s like talking about "an entry-level Mercedes". Running on the ever-popular Fiat Ducato chassis with its fuel-efficient 2.3-litre, 150bhp, 6-speed auto transmission and the whole alphabet soup of modern safety and road-holding devices, including Roll Over Mitigation (wasn’t that a Chuck Berry song? ), the cab is modern, functional and uncluttered with good all-round vision. Both seats swivel to the lounge / dining area. 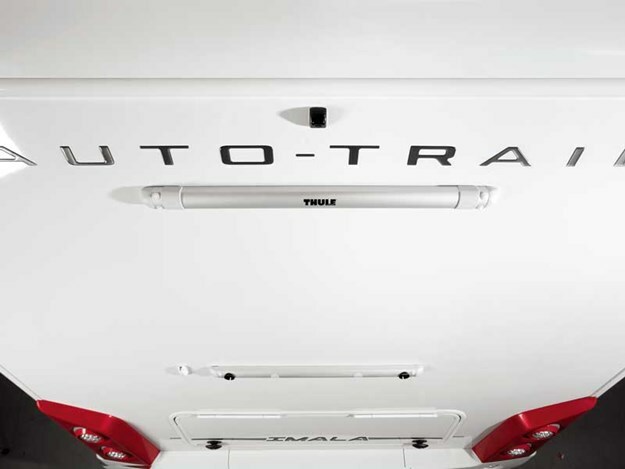 You know it’s Auto-Trail by that signature grey whoosh around the cab. Another trademark: the generous rear garage for all the outdoor furniture, umbrellas, the grandies’ watersports toys and whatever else. Bikes? You can add a rack on the rear. 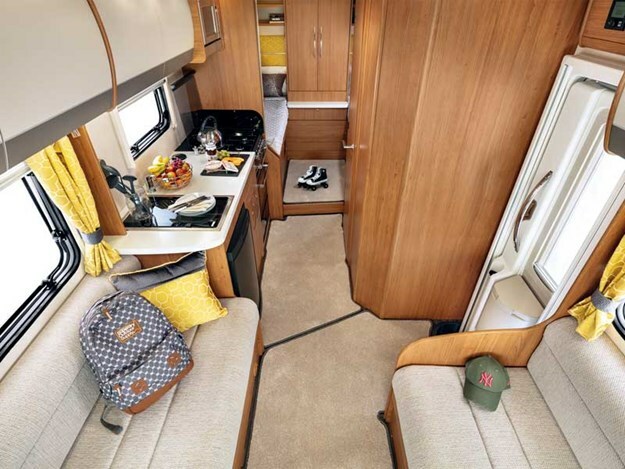 Gary suggests paying a little extra for the GT option and I’d agree: as well as flash wheel trims you get a fitted awning and barbecue ports that connect to the house bottles, adding valuable space as well as entertaining and outdoor sleeping options. Open the door and – even before you step into the vehicle – the attention to detail is clear in the Scandi-blond vinyl floors and cupboard doors, white walls, and especially in the high-quality soft furnishings, all of which give off a luxury-meets-relaxed vibe. Skylights and large windows in the lounge and kitchen emphasise that open, airy feeling; yes, the windows are double-glazed and everything that opens has pleated flyscreens and blinds. 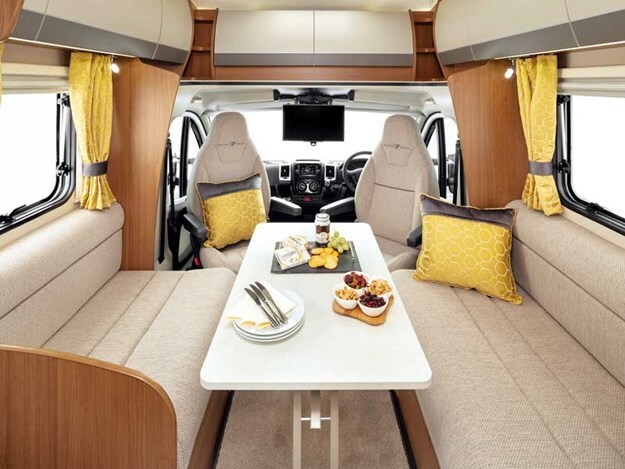 The 734 is intended as a compact vehicle so it’s not the biggest lounge going around; two two-seater sofas behind the cab, on either side of a large dining-table that becomes even larger with an additional leaf. There’s storage under those sofas and the 19-inch TV drops from the cab ceiling, inside the windscreen. 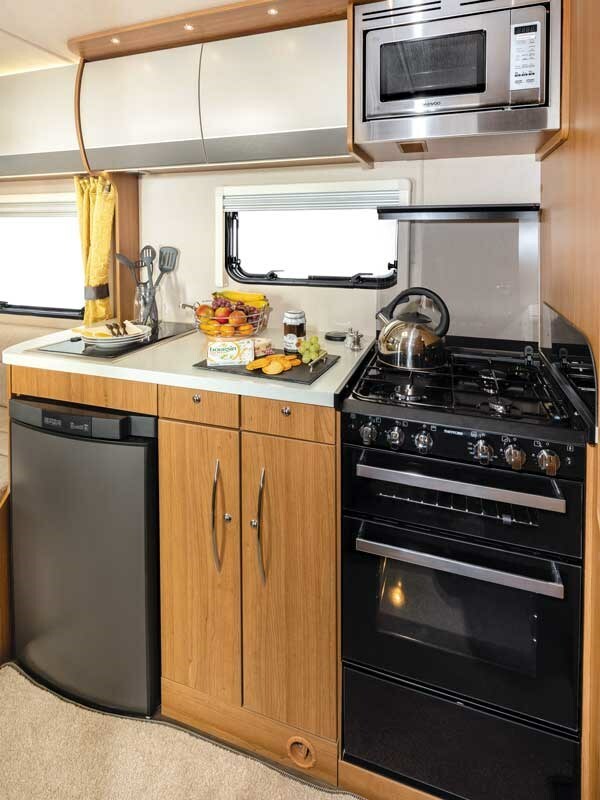 Well-planned and equipped, the 734 kitchen would embarrass many a larger motorhome. The worktops have plenty of bench area; covers on the hobs and sink provide more if wanted. The cooktop has four rings (three gas, one electric), there’s a full oven and grill, 800kw microwave and 96-litre fridge with removable freezer. Above- and below-bench storage is capacious and within arm’s reach. The 734’s point of difference: the two single beds in the rear bedroom are slightly different lengths to accommodate the bathroom. Both are 69cm wide; one is 181cm long, the other is 187cm. You fight it out with whoever you’re travelling with, but there won’t be too many arguments over the large wardrobe slung between them, and each tenant fgets their own picture window, bookshelf and mirror. The kit for a second TV is fitted above the longer bed; I’m not sure if that gives the occupier rights to the remote. Under-bed storage is accessed through the rear garage, rather than from the bedroom. Up top, the Hi-Line bed is 189cm x 118cm, slightly more intimate than a standard Kiwi double, but there’s plenty of headroom, with light and ventilation via a hatch in the ceiling. It’s accessed from a ladder and, yes, there’s a safety net. 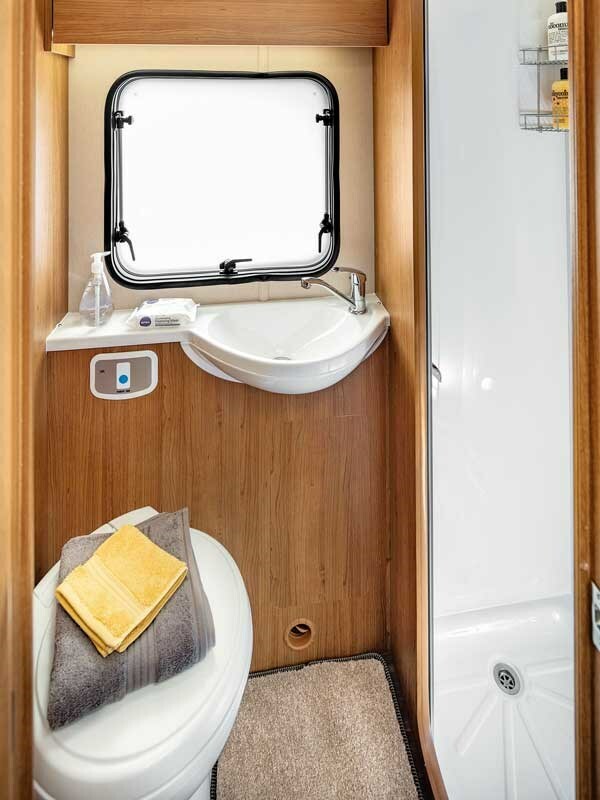 Behind a solid door between bedroom and kitchen – in other words, tucked inside the rear bedroom, which might be an issue if the vehicle is fully berthed - the bathroom has a swivel toilet, handbasin and separate shower stall with folding door. There’s a large backlit mirror and good-sized cupboard. 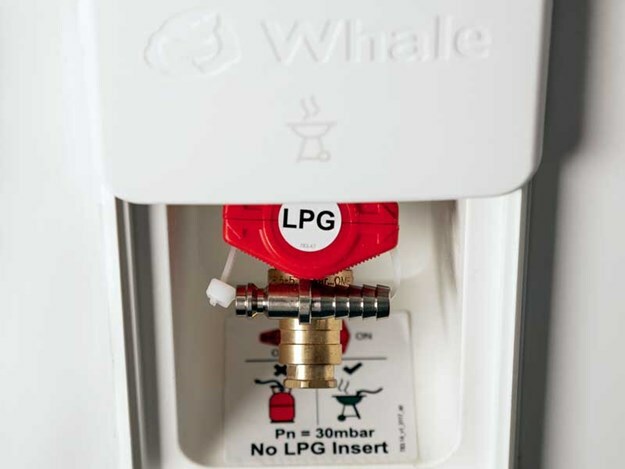 The 734 carries 135 litres of fresh water and 85 litres of grey (that can be upgraded); two house bottles, 9kg and 4.5kg; battery power and a solar panel; 3kw gas and/or 2kw heating; and a 10-litre gas/electric water heater.